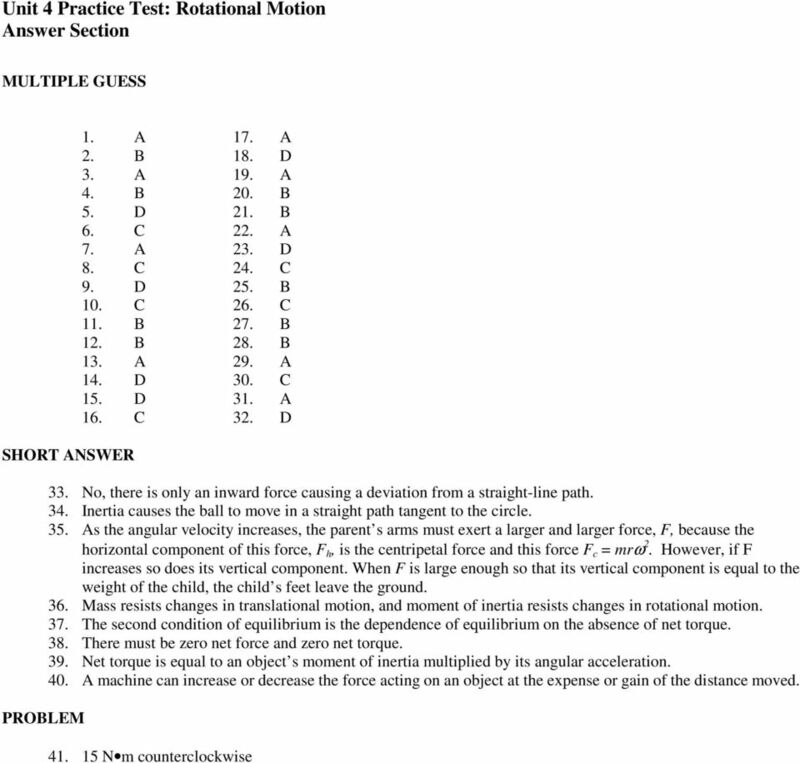 Download "Unit 4 Practice Test: Rotational Motion"
3 22. At which point in the figure above is the approximate center of mass? a. A c. C b. B d. D 23. At which point on the hammer above is the approximate center of mass? a. A c. C b. B d. D 24. Which of the following statements is correct? a. The farther the center of mass of an object is from the axis of rotation, the less difficult it is to rotate the object. b. The farther the center of mass of an object is from the axis of rotation, the smaller the object s moment of inertia is. c. The farther the center of mass of an object is from the axis of rotation, the greater the object s moment of inertia is. d. The farther the center of mass of an object is from the axis of rotation, the greater the object s moment of inertia is, but the less difficult it is to rotate the object. 25. The dependence of equilibrium on the absence of net torque is a. the first condition of equilibrium. c. rotational equilibrium. b. the second condition of equilibrium. d. translational equilibrium. 26. A child with a weight of N sits on a seesaw 0.60 m from the axis of rotation. How far from the axis of rotation on the other side should a child with a weight of N sit so the seesaw will remain balanced? a m c m b m d m 27. According to Newton s second law, the angular acceleration experienced by an object is directly proportional to which of the following? 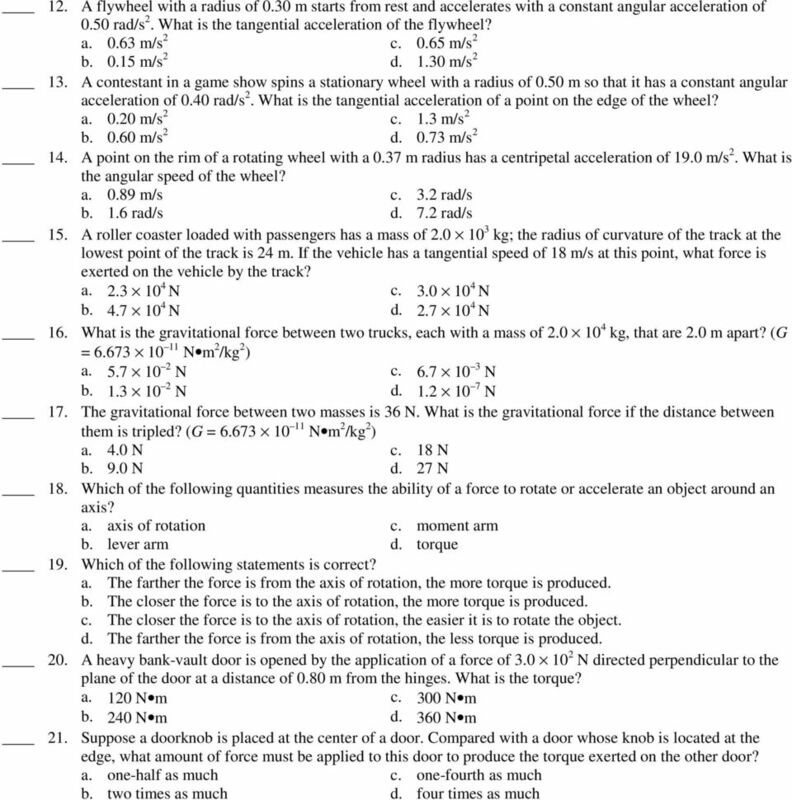 a. the object s moment of inertia c. the size of the object b. the net applied torque d. the mass of the object 28. Which of the following statements is correct? a. With a net positive torque, the angular acceleration of an object is clockwise. b. With a net positive torque, the angular acceleration of an object is counterclockwise. c. With a net negative torque, the angular acceleration of an object is counterclockwise. d. The net force of an object is not related to the translational acceleration given to the object. 5 Problem 41. A 4.0 m board with a mass of 19 kg is pivoted at its center of gravity. A helium balloon attached 0.23 m from the left end of the board produces an upward force of 7.0 N. A 3.5 kg book is placed 0.73 m from the left end of the board, and another book of 1.3 kg is placed 0.75 m from the right end of the board. Find the torque on the board and the direction of rotation. 2. A grindstone spinning at the rate of 8.3 rev/s has what approximate angular speed? a. 3.2 rad/s c. 52 rad/s b. 26 rad/s d.
Find the angle through which the flywheel will have turned during the time it takes for it to accelerate from rest up to angular velocity. ConcepTest 9.a Bonnie and Klyde I Bonnie sits on the outer rim of a merry-go-round, and Klyde sits midway between the center and the rim. The merry-go-round makes one complete revolution every two seconds. Chapter 8 pages 869 870 1. The rotational velocity of a merry-goround is increased at a constant rate from 1.5 rad/s to 3.5 rad/s in a time of 9.5 s. What is the rotational acceleration of the merry-go-round?